A special thanks to Daniel, a friend, neighbor and hunter, for sharing his deer steaks. I was going to actually barbeque them but the weather has been so wet, I opted for something a little more indoorsy. 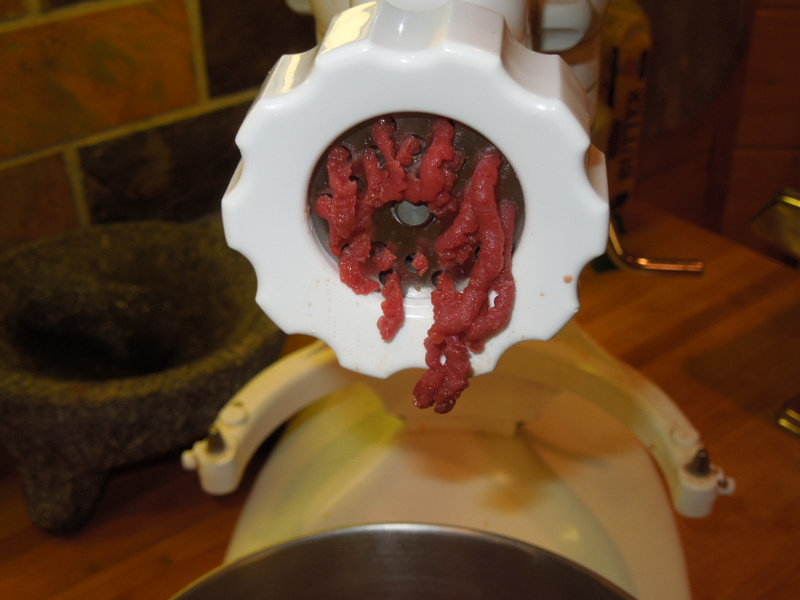 I put the deer meat through my Kitchen Aid meat grinder attachment. Look at the beautiful dark color (no pink slime here)! I then used the meat to fill some fresh pasta raviolis. I have to say that the flavor of deer definitely lends itself well to this kind of dish. The filling and fresh pasta recipe follows below. Combine all ingredients well and use as a filling for raviolis. Store filling in airtight container in refrigerator up to 3 days or freeze up to two weeks. Combine flour and salt, work in egg yolk, then add enough room temperature water, a tablespoon at a time, just to bring a stiff dough together. Form dough into a ball. Let dough rest for about 10 minutes. 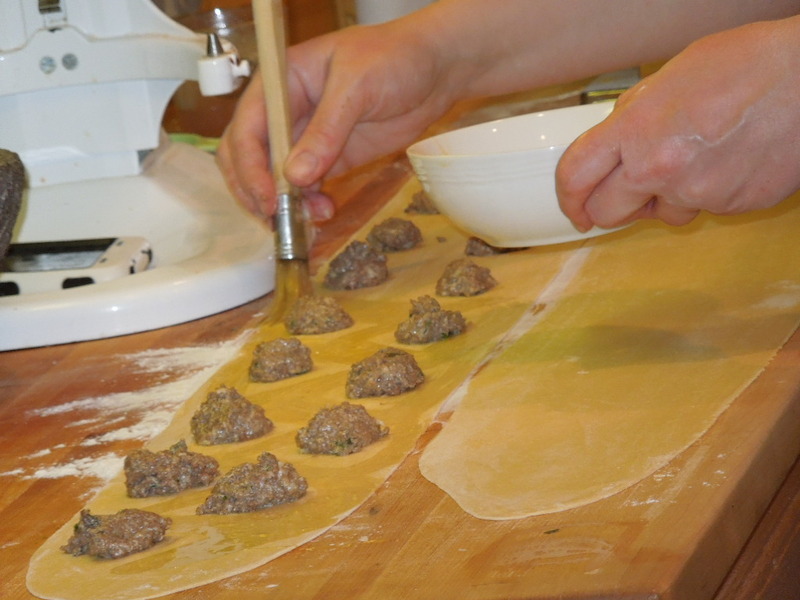 On a lightly floured surface or using a pasta roller, roll dough out as thinly as possible. Spoon ravioli filling on 1/2 of the pasta, about a teaspoon and a half at a time. Brush in between ravioli filling with a beaten egg, then place the second half of the dough on top. Press the two halves of dough together around the edges of the ravioli filling. 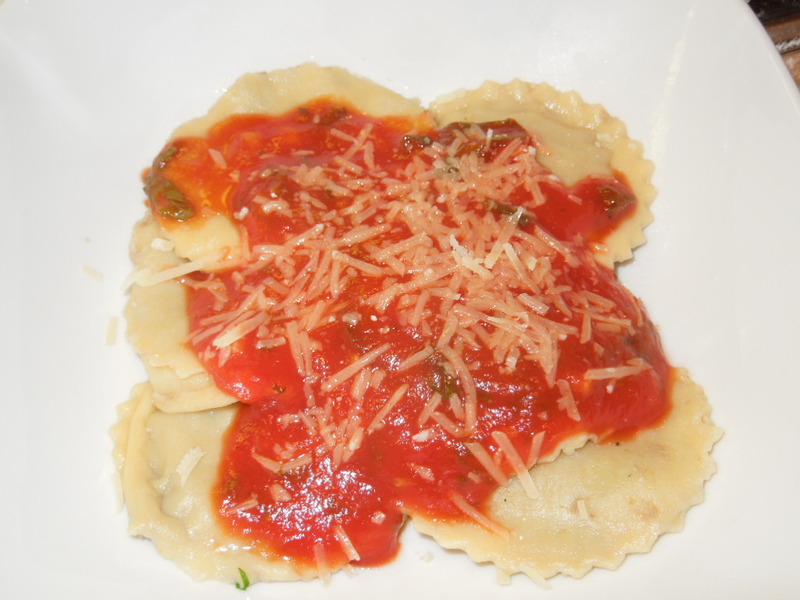 Cut ravioli with desired cutter or a knife. Press sides of the ravioli with a fork or a ravioli crimper to help seal the edges. In a large pot, bring water with a pinch of salt to a boil. Cook ravioli for a few minutes (just until pasta is cooked). Fresh pasta doesn’t need that much time to cook. Strain ravioli then top with a little marinara sauce. Tags: deer meat, deer meat recipe, food, fresh ravioli, ground venison ravioli, homemade ravioli, ravioli, ravioli from scratch, recipe, venison ravioli, venison recipe. Bookmark the permalink.